The testimonies and recommendations from the religious groups made it clear that the human rights situation in Vietnam remains dire. 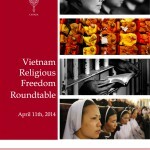 Religious groups in Vietnam are facing ongoing systematic oppression based on their beliefs and personal faith, resulting in fundamental violations of international human rights standards” said Senator Ngo after the roundtable. Because the Socialist Republic of Vietnam has failed to respect the internationally recognized human rights, including the right to freely practice any religion or belief, I believe this raises serious concerns and paves enough grounds to launch a Senate inquiry to further investigate the grave violations of human rights in Vietnam pertaining to religious freedom.” the Senator added. the delegation coordinators and members of Voice.